Redemptorist Fr. Richard Boever has published a new biography of St. John Neumann, written in the first person as if the saint himself was telling his story. 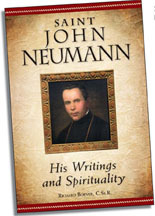 St. John Neumann: His Writings and Spirituality, will be available from Liguori Publications beginning in November. The book may be ordered online at www.liguori.org or by calling 800-325-9521. Fr. Boever wrote his doctoral dissertation on Neumann’s spirituality. He has spoken about the saint to numerous groups over the years. A member of the Redemptorists’ Denver Province, Fr. Boever is currently stationed in Philadelphia in preparation for the Neumann Year in 2011. For more information visit www.redemptorists.net/neumann.